More and more people use automatic follow up email reminders to stay in touch with their contacts and make sure they receive replies on all emails. Of course, sometimes a person simply refuses to answer your emails, but on most occasions the person simply forgets about your email or your email gets trapped into a spam folder. This article will show how to setup and send follow up email reminders from Outlook. – the Outlook Reminders feature can send reminders to your contacts, but it only works if your contacts also use Outlook. So if your contact reads emails using the Gmail web interface or Thunderbird (or anything else but Outlook), your Outlook reminders are useless. 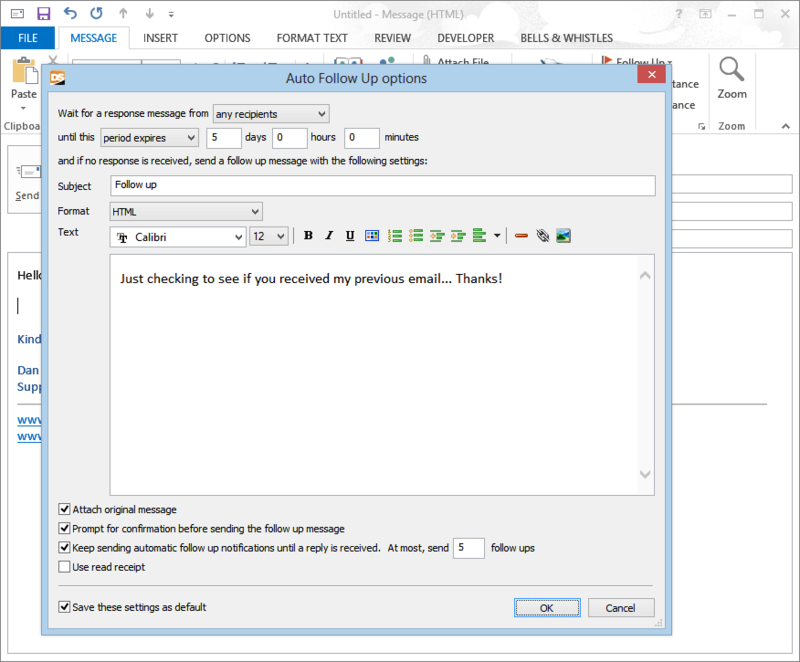 The solution is to use an Outlook add-in designed to send follow up emails on your behalf: meet Auto Follow Up for Outlook. This Outlook add-in can be installed on any Windows version of Outlook and it will send actual follow up emails that can be read by any other email client software. You can download it from here. 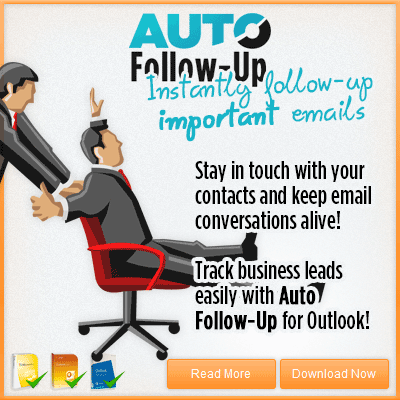 Auto Follow Up will monitor your mail folders for incoming emails. If no reply was received to a given email, during a pre-defined period of time, the add-in will automatically generate a follow up email reminder and send it to the “TO” email address of the original email. – configure follow up reminders for an email that you are currently composing. 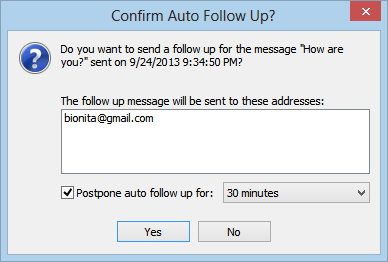 Auto Follow Up works with all Windows versions of Outlook, including Outlook 2013 x32 and x64.